Many of the travellers must be thinking and planning how to save more of the money when they are going to visit a destination. So are those who want to visit Bali someday. You must also be want to know about this, right? Lucky you! Looks like you are on your way to find some of the important travel hacks in this post that can help you to save the money and budget when you are traveling around in Bali especially to keep your bucks from the accommodation that are well known as one of the place that can spend your money a lot. And it will be occurring every single single day from the first night or day you have reserved in ’till the end of your holidays. Ever since Bali is where the international tourists are coming, living costs are increasingly high as well especially when you are at the tourist centres or destinations. Now, imagine if you want to stay in Bali that is close to your favourite place like a beach, you must have been thinking that it will be so expensive right? In fact, sometimes what you are thinking right now can’t be an absolute true and you know that you are agree with me in that. If you can spend a bit of your times to real along and all of this post, you will find some of the useful and important ways or tips that can help you save even more of your money on accommodation in Bali. There will always ways for that. 1. To save more of your money on accommodation in Bali, choosing the proper location is never this important. I am sure that if there are 5 people will be asked about the popular place they want to visit while in Bali, then the Kuta area including the Kuta Beach can be the first answer among the others. It is understood if many travellers will be answering so since Kuta has been the most popular area since a long time ago. But, the most popular place or location has its own price and you should keep on remembering that. I am not saying that all of the accommodations and rooms at Kuta will be so expensive, but you are actually have the other locations that will also interesting to be picked. So, choosing the proper and right location should be on your first priority. And being away from the most popular location won’t also give your travel stories the negative impacts. You can find the other places or area such as Seminyak, Petitenget, Legian, Canggu, or you can even considering to moved out to another location like Nusa Penida and Nusa Lembongan to spend the vacation in Bali. Sometimes, a hotel room at Kuta itself can charge you $100 per night while the other locations I have mentioned above will only make you pay for around $50 or a bit more per night but won’t reaches up to a hundred. 2. Get the rented accommodation when you are traveling with friends or families! You may are traveling to Bali with your friends or families. I mean, there are more people coming with you or you may one of the person who has been asked to joined in a trip to Bali. No matter what the case is, the important thing to be underlined here is there are more people are traveling together. Let’s say, it must be a small group of travellers. If that will be the case, then it is better to stay together closer. You have to make sure that everyone is easy to be reached anytime. There is one of the way you may have been though of about this too which is to find or reserves an accommodation that will be enough for all the team members but all of you will still feel comfort or even stay in luxury. For that purpose, the hotel rooms can’t be the option at all. Even you should have getting rid off them since the first moment you are leaving the house. I am talking about the accommodation types such as condos, guest houses, villas, and things as such so all the people can stay together. And do you know what? Doing this will save more money on accommodation in Bali since such accommodations will only rented in one fixed price no matter how many people you are bringing in. 3. Visit the chosen accommodation’s official site to find the special offers! You may are also getting the special offers or discounts from the reservation sites such as Booking, TripAdvisor, TriVago and many more. But, do you know that sometimes the accommodation offers are also only published their special offers in no other places but their own official sites? Let’s say that you are going to rent the 3 bedroom villa Seminyak for all the team you are inviting to Bali. Then you are checking its official site and thank’s God that the site itself is offering the special discount to save an extra 10% off and you can also take an advantage of get picked up at the airport for free. 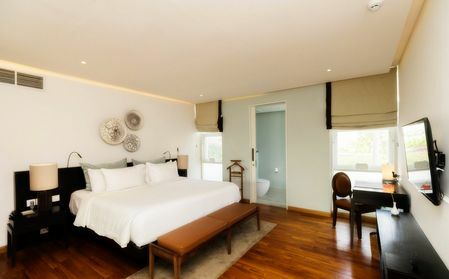 And at the same time, it will also help you to save more money on the accommodation when traveling in Bali. Is there anyone here that are checking their Instagram followers when planning for the accommodation to stay in? If not, you have to includes this one into your list right away. It doesn’t matter if you are not the celebrity at all. But if you are one of the Social Media Influencers, don’t you think that you are actually have got an offer for the accommodation’s management to give them a chance for the paid or endorsement post or by the return of giving your team more discount than the regular people? And it actually doesn’t have to be the thousands of the Instagram followers, but it can also be your own blog with thousands of daily visitors where you can propose to the management to give them a chance for the post placement for their business. Think about your other online assets than both of above and you will have more offers for the accommodations to give you more discounts or even to work together with you while enjoy the tropical island of Bali. You can save on your accommodation as well as getting paid as long as you are doing it good. 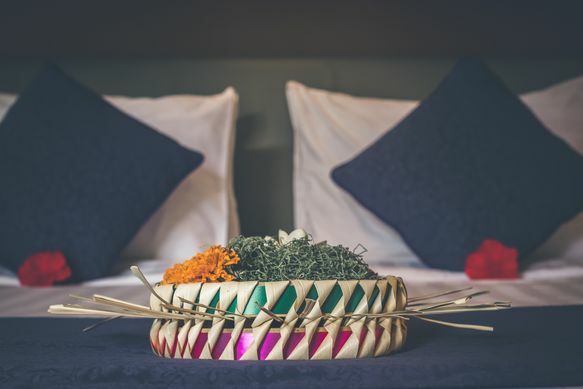 If you are in doubt whether you will be traveling to Bali at the certain date you have determined or not, you’d better finds the stay that will gives you the freedom to make a cancelation at anytime without being cut. If you have send the cost for around $500, then they have to sending back as the same amount you have sent them. It won’t make you save more money on accommodation but this will make you save the money you should have not been sent by accident or when you want to cancel the whole trip itself for the urgent reasons. Those are 5 travel hacks you ca try to do to get save on your accommodation while traveling in Bali. Feel free to add more ways as you have thought of. How Safe To Get The Parachute Camping Hammock Experience Is? If we talk about camping using the parachute hammock, the first thing comes to my mind is the location where we are going to experience it. It is because of the camping itself that will mostly linked to the outdoor life for awhile so that we really need to think about our health and safety. Hammocking is interesting for everyone especially for the youths whose we know that their mind and mental are very unstable. They can do such unexpected activity where adults haven’t been thought of before. And the adults themselves can’t avoid of making mistakes. So, as human being, we’d better watched out of what we are going to do, including when we want to keep safe while experiencing the parachute camping hammock out there. The important thing that has becomes the priority on any kinds of travel we are getting through is not about arrive at the destination. I think, it is all about how to get back home safely without any less at all. So does when you have a plan to reliving the travel passion in you by getting the parachute hammock and start thinking about camping at the spot you have been decided. You’ve got someone, the families and friends waiting your comeback even if you’ve told them that you’d only getting out for a half of the day. I must admit that parachute camping hammock idea is encouraging us to go wherever we need to be since it is possible for everyone to do so. But you should have also prepared yourself for everything that is feared to be able to intimidate your safety. That’s why you need to concern more about your life beyond the traveling or camping you are about to get. As we all know, parachute hammock is coming with various gears and accessories to support the safeness and keep you healthy when you are deciding to camp at the open outdoor. So, even if you can only get one or two gears, you are actually have been decided to be more safer right before you are starting to go out from your house. Takes the parachute hammock’s tarp you have bought before as an example. If you are using it when you are adventuring at outdoor, then you have tried to avoid or anticipate the heavy rain that can cause you a fever or flu. But when you don’t brings it or even decided not to buys it from the the store, you will be running out of ways to avoid the raindrops so you can’t really take a rest on the journey. Have you known someone that can sleep under the rains without any coverage? I bet that you can’t even name one person though. So that, if you are planning to get the parachute camping hammock experiences as you have been imagined in mind, thinking about getting the supporting gears and accessories are considerably important. It should be on your first must-thing to do to ensure that you are getting the right priority for yourself especially your own safety on the trip. Besides have got some gears or accessories, setting up the hammock at more safer spot should be the next thing you have to plan. If you have been read the news about people who were sleeping high between the ravines before, you may feels challenged by that and also want to experience the same to prove that you do are ready for everything. Parachute camping hammock shouldn’t be like that. You should never challenging your life. 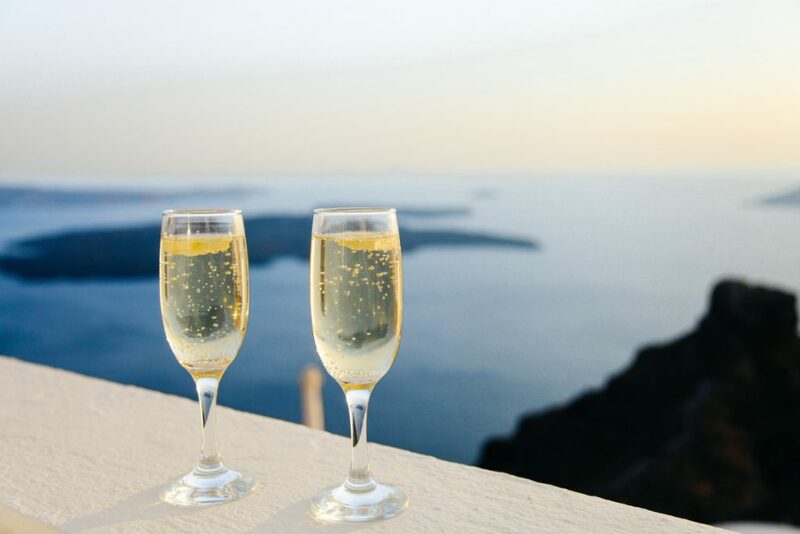 How special have you been rewarded yourself after the stressful works in your job? Have you been thinking before to give yourself a trip to Bali while staying in the Seminyak villas with all the advantages that you could get? If not, how do you know if you don’t needs it at all? Rewarding yourself is a necessity. You have been worked for so long and all the stressful things should be released no matter how well you have been finished all the works before. You need to give yourself spaces to refresh your mind and get all the beautiful experiences to enrich your body and soul. And a trip to Bali can always be the one great option for that. While thinking about this, we have been known that a trip will be more memorable if you will get the best accommodation in Bali while planning about where to go and what to do. But since we won’t talk more about the destinations and attractions that can be vary for some people, let’s see if the accommodation can’t be differently much for each others. Everyone of us will needs to stay in comfort everywhere we go. We need a shelter that can accommodate all of our needs while giving ourself the retreat moments as the trip itself is usually has becomes the escape plan for most of us. Seminyak villas are offering us how to stay in comfort with style while reminding and showing us at the same time that the experiences in a stay can be so much meaningful for all the travellers. What kind of Seminyak villas you can actually get that really feel like you are rewarding yourself? Self-reward is actually one of the parts of dealing with your own leadership that can be mental and also physical. Just by saying a simple words such as ” Good job!” “Well done,” etc can mean a lot for yourself. But today, you won’t only let yourself motivated by saying about those words, you have to realised them all and showing them to yourself by giving yourself a trip and let your body experience the best of staying in a luxury while you are in Bali. This shouldn’t be a motivation alone, this should be the fact. Travellers around Indonesia and many that have came from any other countries have been realised that being at Seminyak area will be one of the great thing to do when you are in Bali. There’s a lot of things to see and do and you can’t even worry about how much money you will spend. According to the accommodation that can make you comfort in your stay and being your own secret hideaway in Bali, there are so many Seminyak villas offers that you can choose base on your own preferences. You can sleep in Seminyak villas where each of them mostly have their own private pools, you can choose the one with the ocean view, you can even rents one with its own beach club and many more things that are available. One of the luxurious side of renting Seminyak villas in Bali is that you can really experience the genuine privacy to keep you comfort and to avoid of all the disturbances. It doesn’t even matter how advent the social networks are, the private side of the stay is always sticking to the villas and not to the other type of accommodations. A villa at Seminyak can really be your own private hotel rooms, where the hotel rooms themself can’t really be your own private villa. You can also choose the villa at Seminyak base on how many bedrooms you will need where this is the most common thing the villa’s managements are doing. You can finds the one for only yourself or when being with a friend and even families. And the best thing that you can actually get is that the experiences of temporary living at Seminyak as one of the best tourism centres in Bali where the beach is only minutes away by walking distance. What can be more interesting than that to feel the tropical breeze in Bali? I barely have nothing to say in mind. So that, if you are lucky enough to reward yourself a trip to Bali, do not forget to think about getting your own accommodation at Seminyak where renting villas can be the priority than the others. From the pink-hued beaches to Komodo dragons, from underling savannah hills to stunning reefs, Komodo lets out wild ambience and action-packed adventure. Each adventure is unique to islands and dive sites that make up the Komodo National Park. The best thing to enjoy it all would definitely by embarking on the best Komodo liveaboard around. Make the most of experiencing the beautiful Komodo with the support of great liveaboard! So.. What Does the Best Komodo Liveaboard Should Have? A clean ship gives the best feeling. No leakage, no puddle of water, and definitely no muddy floor. Being constantly in the middle of water and beaches, you know how easy it is for a ship to get wet and sandy (or both). Also, nobody want to lie in damp sundecks patio or dingy cabins. Whether it’s budget or luxurious, a clean ship is definitely an indicator of good liveaboard. Luxury facilities is nothing if all you get is just crappy service. The level of professionalism of the crews and dive guides is an important factor of a liveaboard that would set the whole mood of the sailing trip. Even cheap, budget liveaboard can feel very meaningful if the crews give all their best—sometimes even go out of their way—to please you. We have heard story of a newlywed couple hiring a small, budget liveaboard for their honeymoon. They even got only one cabin with bunkbeds, so there’s no chance for the lovebirds to even sleep together. But the captain (doubled as chef) gave his best and made special candlelight dinner with special decoration—despite of using humble materials—for the couple, which left wide smile to their face. There’s no better sailing experience than having the crew gives 100% attention to you. You’ll know that this boat is worth spending on if you find floods of praises and raves from the previous customer experiences. As diving is one of the main highlight of Komodo National Park’s attraction, a liveaboard that call itself the best Komodo liveaboard of the area should have these spacious dive platform. The availability of this facility make it easier for divers to store their gears safely, making complicated gear adjustment, and rinse properly. If given the choice, no one would want to sleep in an open deck, jostling with dozen other passengers in the same open deck, with only thin mattresses to lay their back. No. If given the choice, everyone would definitely opt for ensuite cabins with AC, double bed, and private bathroom. Because privacy is a luxury, and having one to support your well-being during the entire trip is definitely a life-saver. Those little bottle of soaps, shampoos, and toothpaste are some little luxury that won’t be available in otherwise budget liveaboard. When you are sailing in a remote destination, being completely isolated from the outer world, and live in a boat, these availability of these little luxury makes you feel at least you are sailing with the best boat in the park. How Bali Diving Course Bring A Perfect Experience For You? Diving in Bali offers a unique and spectacular experience. Call as A Thousand Temple, Bali provides a number of fantastic dive spots with facilities for all levels of divers. Bali is a meeting between all world divers, no matter amateur or professional. The diversity of Bali’s marine wealth gives such an impression that the divers return immediately. The climate in Bali is very pleasant and allows divers to dive throughout the year. Clear visibility is perfect for you to take the Bali diving course. Rows of dive operators offer training for all levels. Although Indonesia is divided into 2 seasons, the rainy season and summer, don’t worry about diving even the diving rainy season will not be canceled. However, if you are a beginner and want to take the Bali diving course, you should avoid the rainy season. 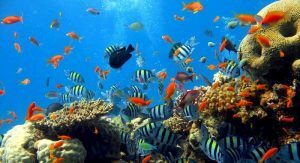 The Bali diving course will be an impressive and extraordinary experience because the waters of Bali offer a variety of marine life and other dive sites. You will see lots of dolphins, seahorses, barracudas, manta rays, and even sunfish. The Bali diving course allows you to dive and find the famous original wreck, the wreck of the USS Liberty. A number of diving operators are offered so that you get maximum diving. The experience of the Bali diving course is supported by many media, videos, books, which lead to briefings that are very useful during dives. Guidance for a diving training operator for beginners is perfect which will produce diving cards. This allows Bali diving participants to dive at any time up to their dive ratings. For you beginners, after completing the Bali diving course, you need to determine what you want. Is continuing training at a high level? Or quite satisfied with the certificate obtained from the Bali diving course. Going down to the seafloor is fun. Taking training in Bali diving is perfection. Most beginner divers never regret taking diving training. Bali diving courses, both beginners and professionals, not only bring you to see the amazing underwater scenery of Bali. There are many more benefits that you can get when completing a Bali diving course at the level of your dive. 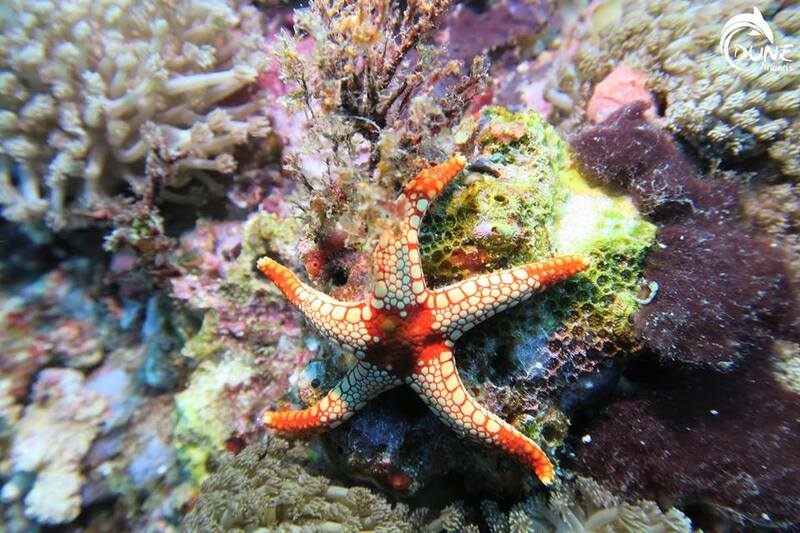 It’s fun diving in Bali, not just underwater scenery that you can enjoy. There are many other interesting destinations that you can explore after completing the diving course. Don’t forget to always check diving equipment for every dive. Diving equipment failures are rare. But you need to be careful to keep your diving equipment because this is what keeps you alive under water. When you think about Komodo, the perfect imagery will include tranquil water, stark beaches, and savannah field shining with crips tall grasses. The day pass slowly as you chill on the deck of Komodo boat, bathing in the plentiful sunlight as the boat cross the peaceful Flores Sea. That’s how the ideal trip would be. Alas, tropical countries are bound with rain. Though the majority of Komodo operators are closed in during the wet season, the rain could fall in the least expected time. Even in the middle of June, sometimes you can get wet by sudden rain. The chance of unpredictable rain gets even higher if you choose to travel during the shoulder season. So what if rain do falls during you vacation to Komodo? Would it be the end of the world? Despite of your disappointment, light rain is pretty common in tropical countries. Luckily, Flores its in the eastern region of Indonesia, which receives fewer perspiration than those in the western part. That means rains in Flores are quite sporadic and short-lived. When it does actually rain, usually it wont rain for a long time. The sky will cleared up just in one to two hours later, so keep believing in the sun! The fun doesn’t have to stop when the sky get heavy. Think about the rain as a chance to truly appreciate the comfort that your Komodo boat gives. Go to the kitchen and ask for a cup of hot tea (if they haven’t provide it in the table already! ), take a moment to sit down, and just get in the moment! Or start a light conversation with the crews; asks about their hometown, their experiences as Komodo crews, or anything that sparks your interest. They will be delightful if you want to get to know about them. And who knows, they might have interesting stories for you to wait for the rain! The rain is also a perfect time to slow down. Pull out your books or Kindle—and the next thing you know, the storm has already passed. It’s also a great chance to take time to sort and edit your photographs during the trip! When the rain is over, you already have a handful of gorgeous pictures ready to upload! Sometimes, the rain is just as light as sprinkles of water that would be easy to pass through. But still, you might get a little wet. Get your raincoat ready before stepping out from the Komodo boat and commend the Komodo exploration! We highly recommend to pair up your raincoat with rubber sandals instead of trekking shoes as the islands might get muddy. When you want tot curse the rain, remember; the nature needs it! That’s the same nature that we cherished so much for refreshing escape. So stop grumbling and try to enjoy the trip as it is! Planning about spend the holidays in Bali will serve you with a variety of best locations you can visit. If you are wondering about where to stay, you can make Seminyak as one of the best stop for that. This is one of the most crowded area in Bali, but you should never think that the more people are there, your luxurious silent that you are looking for will also be disturbed. There are many accommodations that will serve you with the leisure of high privacy spot along with the luxury of the tranquility. Hotel rooms are offering many choices, condos are also available, but the luxury villas are always recommended when you are in Seminyak. At least, that what I have seen for around 7 months living and working in Bali. I dare to say that Bali itself is an island of thousands villas. You can find them easily at any popular destinations here. I think that I won’t need any other distribution maps of different accommodations. Seeing the above image is actually triggered me to considering Bali as the island of millions accommodations. Seminyak is popular for many reasons. It is a village with its own beach, long beach line to be exact that I think it will be fits for not only hundreds of people, but thousands. While the villas are famous as the place for more relax and stress-free holiday, I think many of you won’t believe that it is a place for spending your vacation. 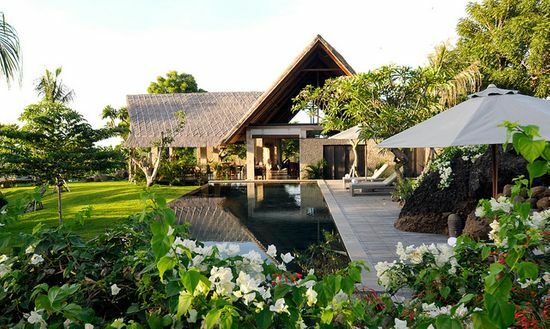 Of all the villas that I have been known, one that will be in my recommendation for the travellers is to make a reservation or rent one from Hu’u Villas Bali. There are some choices that have been provided for you. You can opt to stay in a 1, 2, and 3 bedroom villas. They can really be great for a person or a couple to stay and even more for a group of people or families. Even if those luxury villas are not enough as you are requiring more bedrooms for more people, you can get advantages of the interconnected villas that can be configured up to 13 bedrooms possibility. You will then keep on stay close proximity with all the people you have been brought with. All of the above type of the luxury villas Seminyak will be provided with the high private pool where no body can uses it but the guests who have been rented the villa. You will also provided with buttler if you will needs one to assist you in many possible ways. Even, there will be one that will always be there every morning or afternoon to clean up the pool in your stay to keep you experience the clean swimming pool. It is a simple thing but surely really important for your stay. Another housekeeping staff will also provided as your request to ensure the luxury villa you are staying is in its prime and pristine condition. Anyway, it won’t be interesting if I don’t really talk about the surroundings area that you are possible to experience and explore for more extra views, attractions, etc. These luxury villas Seminyak are not only perfectly located at the popular village in Bali, but all the guests can also possible for being easier to walk to the beach in just two minutes or three. Even if they are not the beachfront villas at all, its proximity distance is certainly a distinct advantage. The villas themselves are also provided with its own restaurant called as the Sea Vu Play within a minute walking distance, as well as the bar called as the Den, and the Fortitude Bali as the home of crossfit at Petitenget to make you stay healthy by keep on exercising on your trip. When you are staying in this villa, getting around to the neighbourhood will also recommended. Even it will be te interesting thing for seeing closer to the Balinese cultures and religion rituals. There are some of the nearby temples either at the beach or at the side of the main road of Seminyak and Petitenget. If you are in luck, you will be seen some of the Hindu’s followers are preparing the offerings and the rituals, especially in when it comes to the day of the Hindu’s festivals. There are also many other destinations you could visit in Seminyak such as the Mrs. Sippy Bali as the largest salt water pool in Bali, heading to Potato Beach Club as the most popular beach club in Bali, enjoy at the open-air cafe called as the Nook Bali that are presenting you the way to spend your time in a village atmosphere with the green and wide rice field view, and many more. There are actually hundreds of destinations when you are staying in this luxury villas Seminyak and getting around to explore anything in the area. If you think that you are affordable enough to stay here, then you you’d better contact to management or visit the official site now. If a heart-shaped circle of red roses petals encircling giant “I Love You” letters made of another dash of rose petals with dozen candles in between doesn’t really include in your dictionary of romance, then you maybe you need something fresh to keep the sparks lighten up. For you who thinks candle light dinner with dress and tux is cheesy, we are sure that tropical holiday won’t fail you. After all, nothing screams a romantic holiday than remote sugary-sands destinations and crystalline waters of Komodo, a hidden haven in Flores frontier, Indonesia. And here, we don’t only have white sands beaches, but also the rare blossoming pink beach that gonna make your couple trip even more cheery. Trip to this off-the-beaten path bliss is now getting more popular among couple and honeymooners. 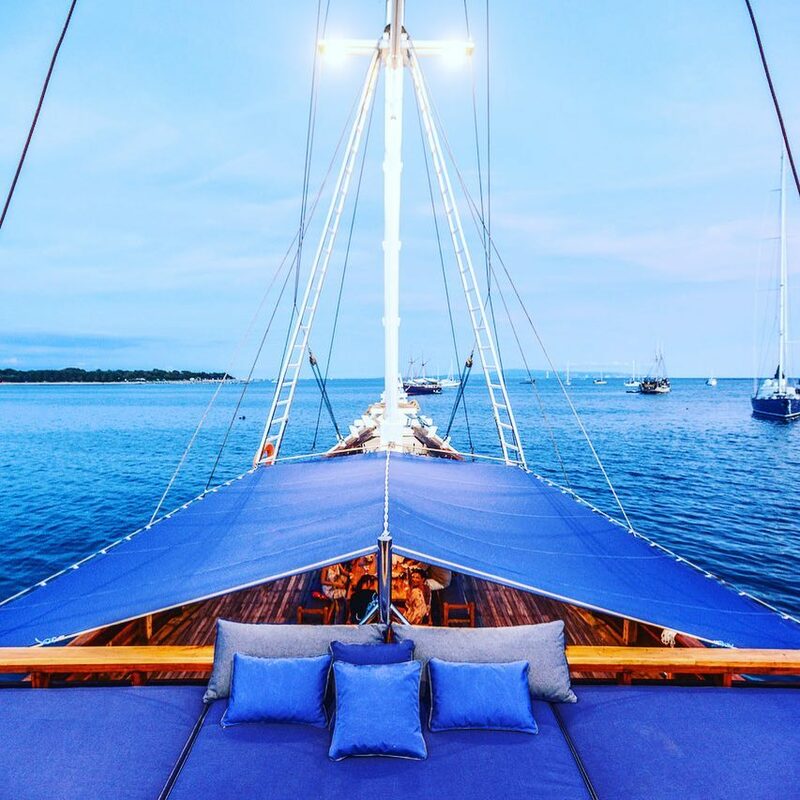 Komodo offers a sense of seclusion from the busy, outer world and endless refreshing sight to behold—that will be very pleasant to enjoy with our better half. The frontier is an expert to re-connect couples though exotic landscape and wonderful underwater sight. But what makes a Komodo holiday even more special is the accommodation. Instead of tropical beach huts or bungalow resorts, you gonna spend the whole time of your trip in a Komodo liveaboard with your beloved. Better than hotels, these liveaboard boats gives all the luxury and facility of a resort with special experience of sailing. For you who are liveaboard-virgin but still want to experience Komodo with your partner, here we have collected the best Komodo liveaboard to sweeten up your couple trip. When you talk about Komodo and romantic trip, there’s no way to skip Alexa. Think about a highly luxurious, private resort in the body of a ship. Now you got Alexa. 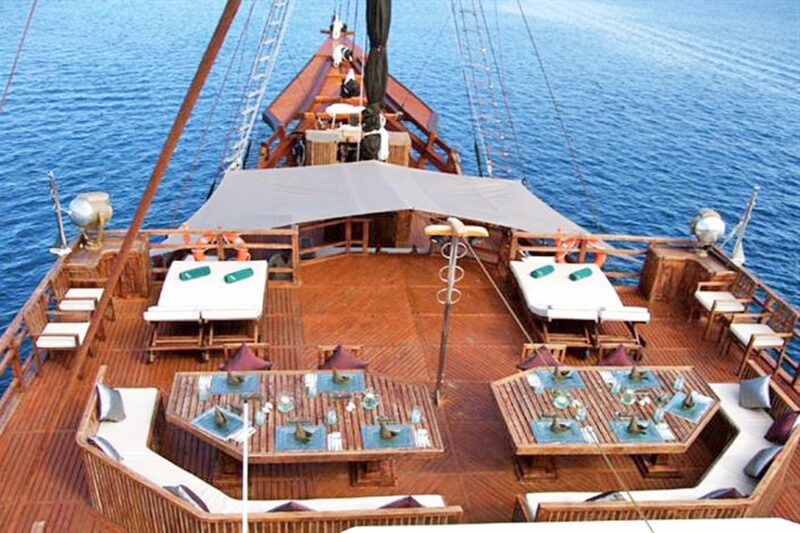 This gorgeous ship was built with exceptionally romantic honeymoon trip in mind. With only one cabin built in this 31m long ship, that means an ultimate privacy! You and your partner are free to do whatever you want to do, enjoy the facilities of the liveaboard, and receive all the attentions for the crew! In Alexa, the fun is divided equally between Komodo exploration and liveaboard stay. In times when you are not busy hiking Padar’s hills or greeting the mantas, Alexa is ready to pamper you with spa therapy, fresh seafood and world-class cuisine, and spacious decks just to lounge and bask in tropical sun. One of the best thing in Alexa that might be unavailable in other liveaboard is a chance to arrange bonfire and candle-light dinner in nearby island. You can’t have bonfire dinner in exotic setting everyday! 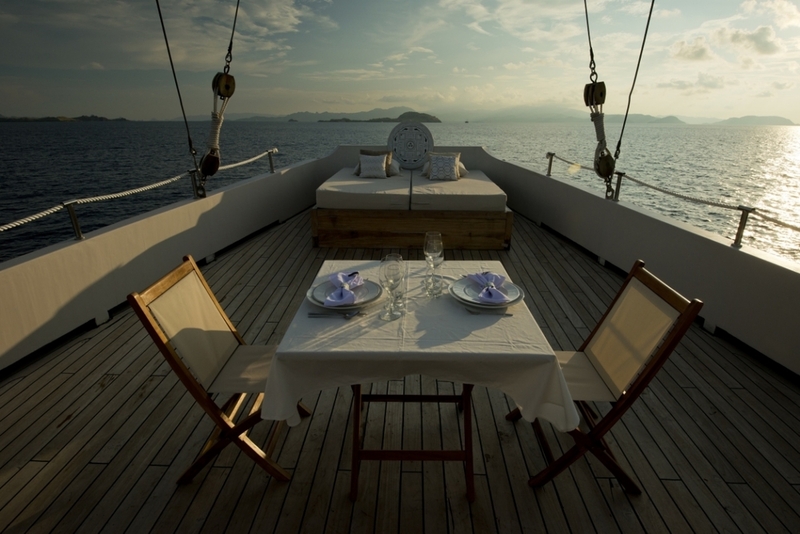 No words left, Alexa is the best Komodo liveaboard for couple who seeks fun in total privacy. Not every couple trip should be done in totally private, expensive liveaboard. Sometime the best Komodo liveaboard experience come in much humbler setting. 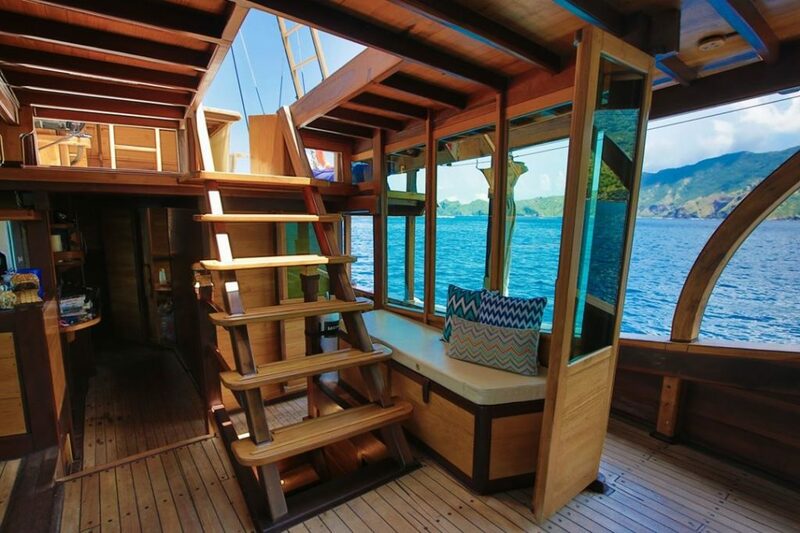 Kelana is one of those yacht-like liveaboard who take pride on its Sulawesi heritage. If you love Pinterest, you gonna absolutely love. 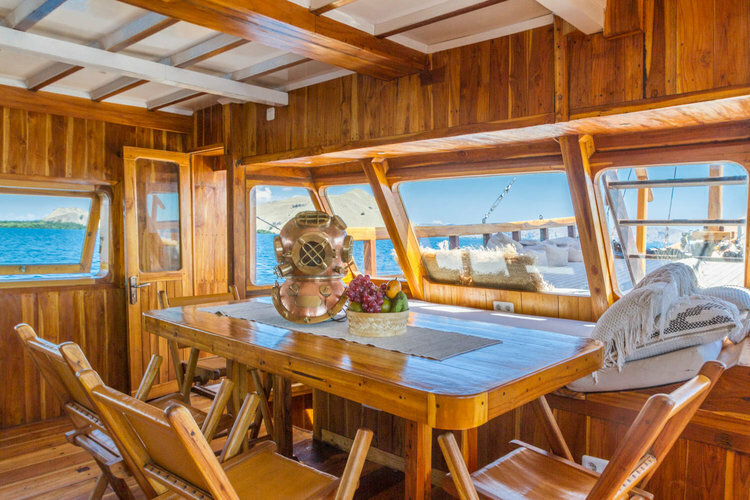 The boat is heavily dominated with warmly polished wooden architecture, featuring white-washed loungers and boho-chich woven tapestry. Kelana is a place where all you want to do is lazing up with your beloved after spending the day between Komodo’s chromatic corals. The five star vessel boasts eight lavish cabins and the one-of-a-kind liveaboard sky dining experience. Arenui is not just an everyday luxury—it’s a boutique liveaboard determined to give passengers a sumptuous sailing experience. With such facilities, you can put worries of getting seasick behind. A sailing trip to Komodo in Arenui would make a perfect gift for wedding anniversary or other special occasion to your beloved. How Useful The Portable Parachute Hammock Is For Your Life? 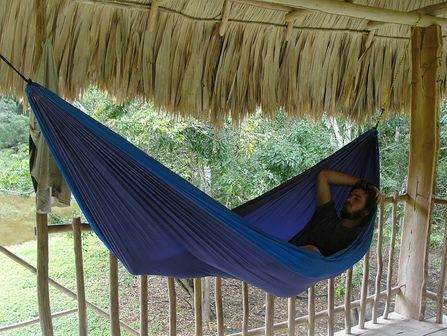 Portable parachute hammock is usually relates to traveling. It is used especially as the shelter so we can take a sleep or rest. And until today, it still seems to be a trend among us. Even I have seen those people who are not traveling a lot, but looks like influenced by they who are using a hammock regularly. It is because the portable parachute hammock itself is truly for everyone. No matter who you are and what age are you, people can really uses it for various activities as long as there will be one or more conditions that won’t allow you to use it. 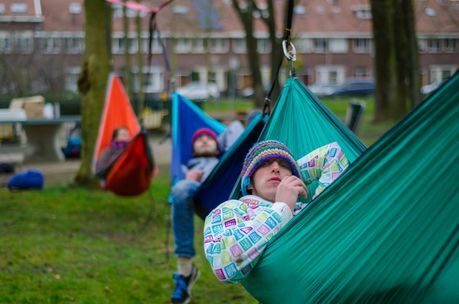 While this type of hammock is still on trending, there is also another one old activity that becoming more popular because of it. You may say it is a picnic thing or you may considering it as a sport. It is a camping that many of us may have been forgotten it for so long in this modern society. Camping is allowing our body to make movements. Mostly, you will think about where you will experience one. Either at the small forest that you have been visited when you were in a scout or you may will find another one spot as you need. Getting our body to be moved by camping at anywhere surely can be considered as one of the exercise with some advantages. You can get your sweat out for your detoxification, smooth the blood circulation in your body, chance to breathe the fresh air, get a clear mind, and many more benefits. By get yourself or your friend a portable parachute hammock and decide to get a camping, you are possible to get all of above advantages and even more. The portability factor that comes in a compact design will make the parachute hammock getting more lightweight to bring. Even a 10 years old children can carry it, let alone the teenagers or the adults who are bigger and stronger. On above where I have mentioned some of the portable parachute hammock’s benefits, they won’t be all that you can get. In various online forums and communities I have read, people were telling stories that no matter how big their interest to get a hammock, sometimes it was hard for them to go out for camping. Many of them are the grandpas and the grandmas, some of them are still the young parents that can’t go out for long because of the job. Yet, they still get theirself the parachute hammock to be used in their house. Even though you are not possible to take a short travel for hours in a day or week, they still experience some of the interesting things comes with a hammock in their home. Some of them were even admitted that they have got an insomnia before for months and years. They were even taking medicines for certain period of times as the Doctor suggested them to do. But, there’s nothing significant changes as what they have expected. I know that medicine won’t be the answer of any illnesses. Sometimes, you just simply need the right item and time to heal yourself. That’s why the portable parachute hammock is proven useful for life and can be used by anyone not only for a recreational purpose, but also contributing in healing and improving our health. What kind of vacation are you looking for? When you get bored with a luxury vacation, the adventure can be a challenging vacation alternative. Skating? Climb up the mountain? Or dive? Diving activities are included in activities that are in great demand by tourists. Seeing underwater scenery offers its own uniqueness. Everything we see under the sea is different from the land. Many underwater mysteries are amazing to study. Talking about diving, you need special skills for that. Basically, diving is the same as other hobbies that require basic understandings. Scuba diving for beginners is a quick way to explore the underwater. You will get a basic understanding during training. It doesn’t take long for you to explore underwater after completing scuba diving for beginners. Where scuba diving for beginners should go? Surf the internet and you will see a row of the world’s best diving destinations for beginners. Search and be careful because not all destinations are right for beginners. It will be in vain when visiting tourist destinations that are not for beginners. Bali is one of the destinations for scuba diving for beginners from many countries. Bali’s natural wealth, both land and underwater, is increasingly popular and is a favorite from year to year. Bali has always been the best scuba diving for beginners. The recommendation of professional divers and dive operators for beginner divers is Tulamben. The mystery of the shipwreck in Tulamben is easily visible at a depth of 2-15 meters. This is the best spot for scuba diving for beginners. See the underwater beauty of Bali that matches your diving skill level. Some other places besides Tulamben are also suitable for scuba diving for beginners. You just need to contact your local dive operator, pick up a training package, get a diving certificate and be ready to explore the stunning underwater world of Bali. Who doesn’t know the Maldives? Its popularity is not inferior to Bali, Philippines or other diving destinations. No need to dive in to see the amazing beauty of the underwater scenery in the Maldives. Make sure you have a certificate, at least a certificate of beginner divers to dive in the Maldives.